Bands rock, roll, drop beats and sing sweet melodies, all for the sake of connecting with fans and sharing experiences through the joy of music. Whether you’re an individual musician or a 10-person band with horns, cellos and backup singers, an online presence is a must for you. 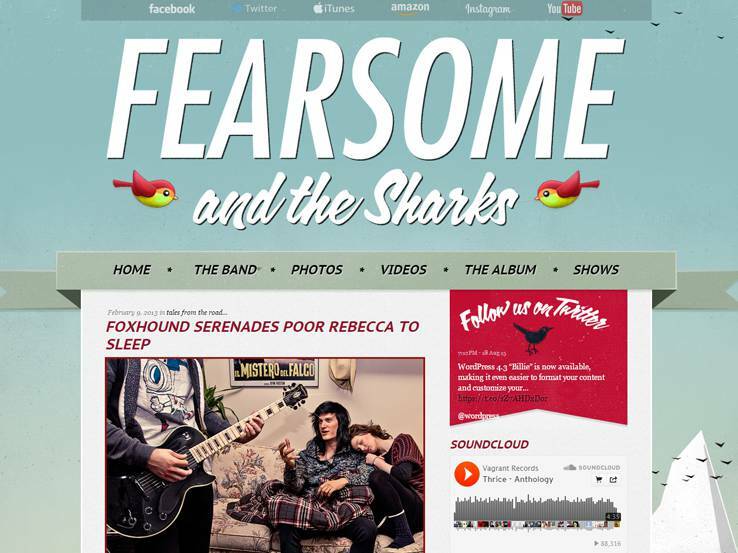 And WordPress themes for bands are the best way to create one. Think about the unlimited possibilities for you when building a band website. You can post music tracks, share information on your upcoming gigs and chat with your most loyal fans in blog comment sections or through message boards. But how do you get all of these features on one simple website? 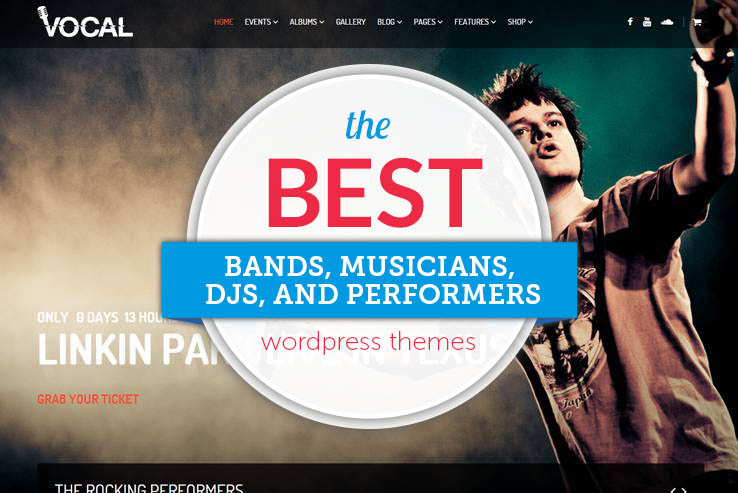 Checking out some of the best bands themes for WordPress is your best course of action here. But it can be a pain finding the ideal theme for your band, since all you should be doing is focusing on your music. That’s why we compiled a list of the top options from around the internet. So tune up your guitars and let us do the tech research for you. 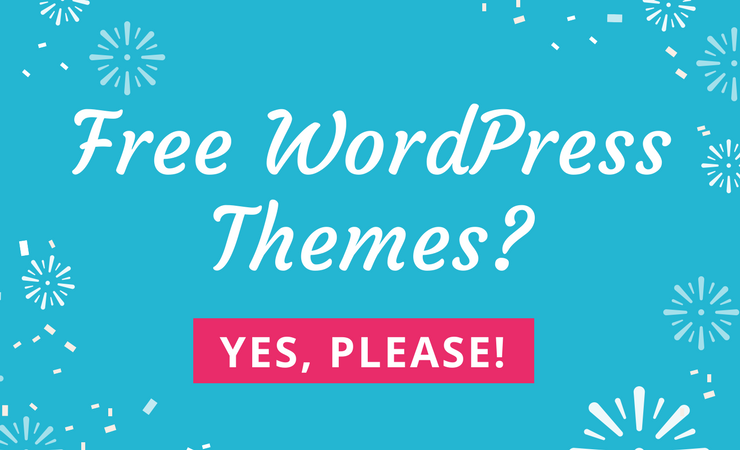 Before we dive headlong into your list of options, we first want to address what you should be keeping an eye out for when evaluating these themes. A bunch of band-related stock photography isn’t enough. Any theme you choose needs to have features that cater to the needs of bands as well, like galleries, audio and video embedding, playlists, and eCommerce. Beat Heaven is a responsive music WordPress theme for artists, musicians and event planners that want to stand out from the crowd. It comes packed with a bunch of features and specific pages like artist, albums, locations, events and more. The design is modern flat and full of details like the audio player, album previews, and many other significant elements. Also, BeatHeaven comes with your typical pages including portfolio, gallery, about page, contacts, and shortcodes. Creating a band website requires you to offer something unique and striking. 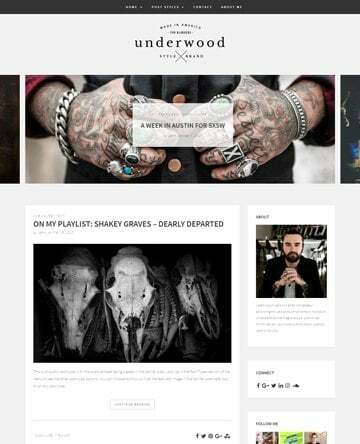 Underwood helps you do that by offering three homepage layouts. The large slideshow will be useful to display photos from your recent concerts, live shows, or other events. There are various ways to communicate with your fans – you can use traditional blog posts, publish an audio or video post, or use any of the gallery post types to make your website fully interactive. The intuitive theme customizer section allows you to choose the colors, font, and other styling options from a single location. Thanks to the customizable widgets, you can easily display your contact information, social media links, latest blogs posts, and blog archive on the sidebar. Complete integration with Contact Form 7 and other similar plugins will make it a lot easier to create and display contact forms on your website. 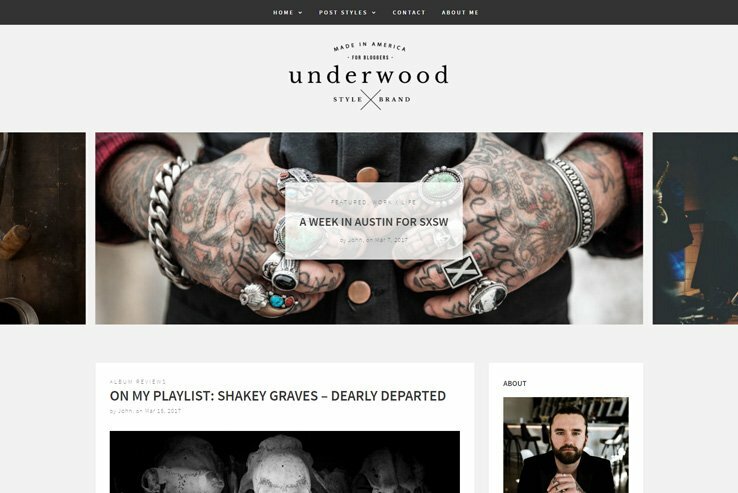 As Underwood comes with full support for WooCommerce, you can sell single tracks, albums, event tickets, t-shirts, or other merchandise from your website. 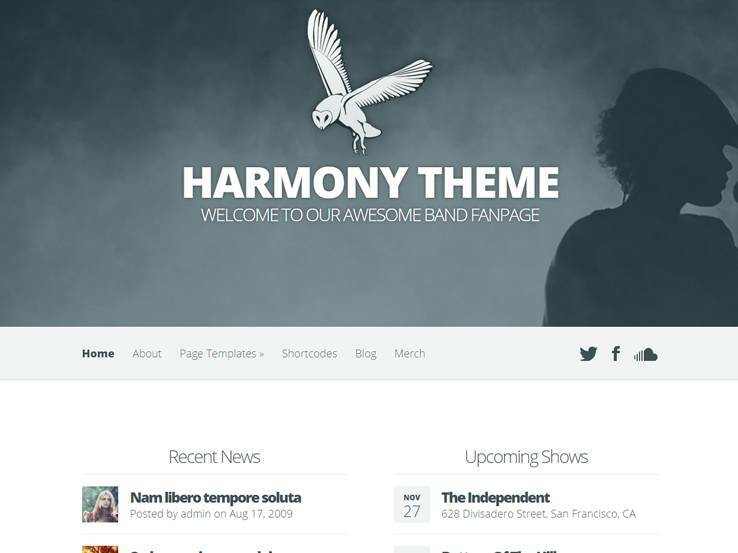 The Harmony WordPress theme is one of our favorites for bands since the folks at Elegant Themes put together a stylish and hip solution for all types of bands and musicians. Post your songs so people can play from the convenience of their own browsers and also plan and handle events for your followers to come and see you play. The big and beautiful background images are designed to put the spotlight on your band so you can add images from your concerts, gigs, or recording sessions. The Harmony theme also includes unlimited color choices so you can easily incorporate your brand. The responsive theme also includes localization support in case you happen to have fans in different countries. The shortcodes allow you to easily add elements like buttons and columns to your website without having to touch any code. Along with page templates and social media integration, you can’t go wrong with the Harmony theme if you’re in a band. 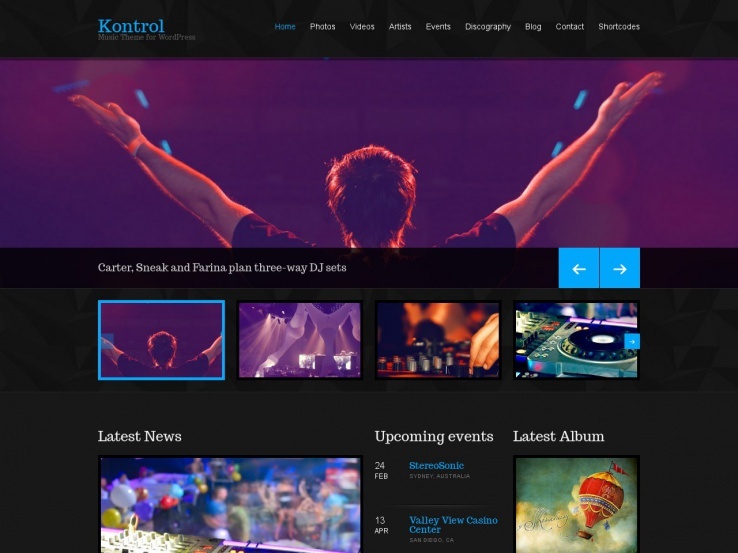 The Kontrol theme comes from CSSIgniter and it’s built particularly for anyone who fancies themselves music players. Bands, radio stations, DJs, and other musicians can take advantage of this theme to get the word out about their fresh tunes. The default theme has a darker background which gives your website a grungy feel and the discography management area allows you to easily create track lists to share with your audience. Event management provides recurring events in case you have repeating gigs and six content types allow you to add huge sliders, artist information, galleries, and videos. Try out the custom widgets to include links to your social media profiles and easily customize your website’s colors thanks to the unlimited color options. If you’d like a responsive WordPress theme with a strong visual presence for your band, consider taking a look at the StereoSquared option. The flexible homepage layout is rather unique and it is easy to edit and customize even for beginners who aren’t familiar with the code. The event management system is ideal for sharing information about your upcoming gigs. Choose between five content types to add a variety of content. You can easily include galleries, releases, events, and more. Multiple color schemes and custom widgets are a must-have for most bands since they allow you to show off your unique style. Don’t forget to upload your own logo which can be done with a click of a button. 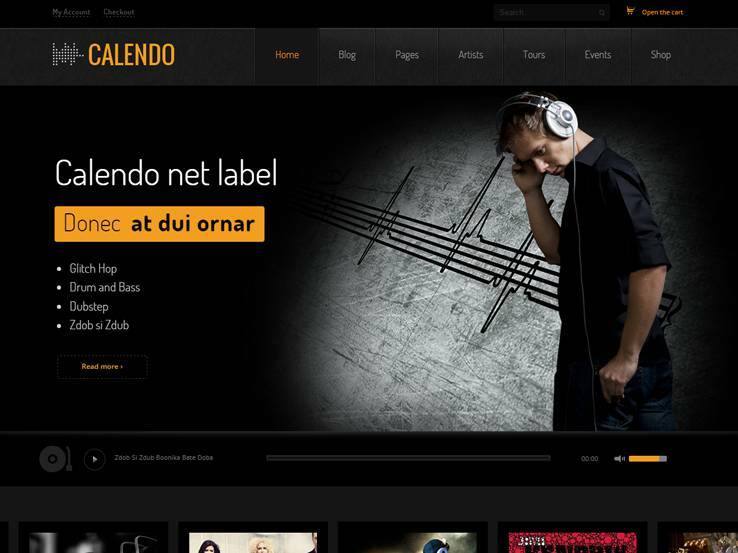 Calendo is a responsive theme and it’s prefect for bands. The intelligent theme options panel makes customizing the look of your website a breeze and different typography options allow you to easily change the fonts on your website. Shortcodes are available to add modules like sliders, tabs, buttons, and alerts. You can also take advantage of various post types to add a variety of content in your blog posts. The gallery post type is a nice touch but the true noatble post type is the audio post type which allows you to organize and display music clips without any problems. 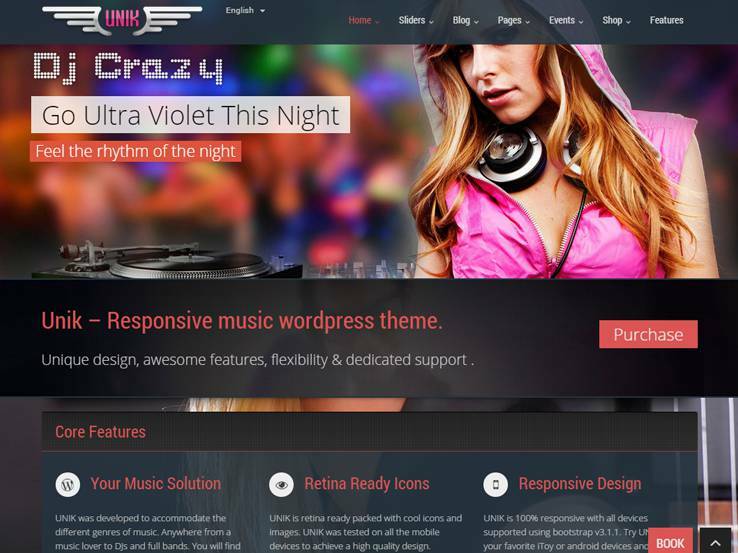 The UNIK theme is sold as a universal music WordPress theme, but we think it works best for new bands. The responsive design is great for making sure even visitors on mobile devices can view your website without any issues. 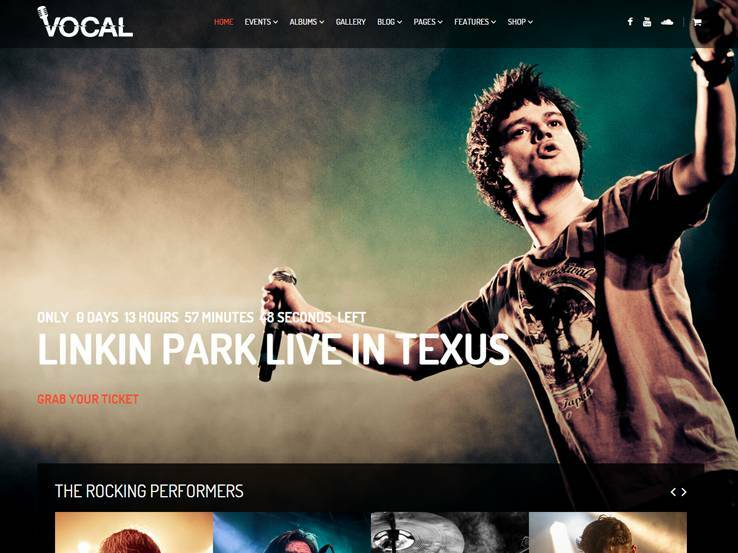 It also has unlimited colors and layouts which allow you to create a unique website for your band. Play around with the shortcodes to add buttons and sliders and consider integrating the theme with WooCommerce to quickly sell merchandise such as t-shirts and CDs. Two premium sliders are included with your purchase which are sure to capture the attention of your visitors. You can also use them to make announcements or share information about upcoming events. The default theme elements and backgrounds have a darker yet still colorful vibe but you can easily change the colors through the theme options panel. 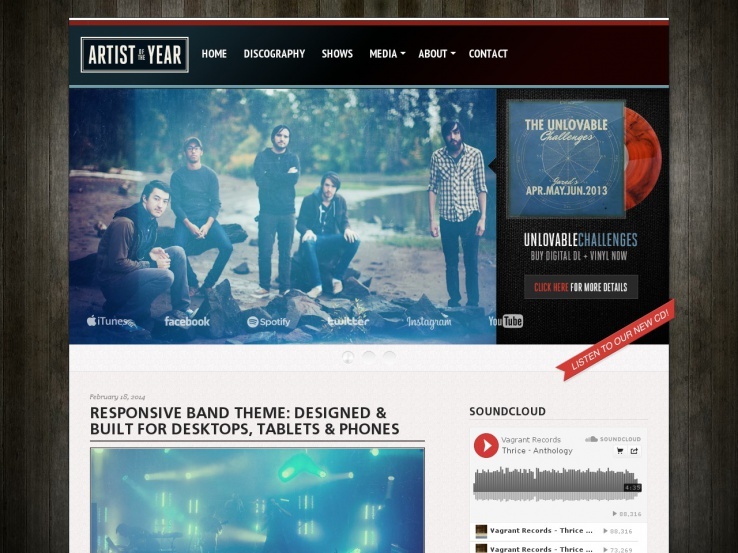 Check out the Speaker theme if your band is into one-page WordPress themes. If you’re not sure about the one-page theme layout, just keep in mind that it maintains the majority of your content on a single homepage. This way, all your content is readily available for your fans. Add a list of your music for your fans and use the tour date features to post updates and keep everyone informed about your band. The responsive design is always a bonus for those who primarily use their phones or tablets to surf the Internet and the video background area is a great way to introduce your band to your website visitors. 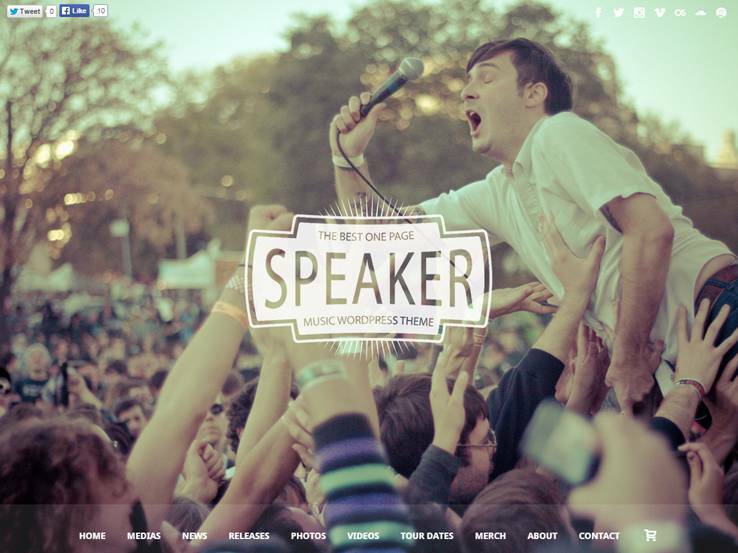 The Speaker theme also has a parallax effect which adds beautiful animations to your website without slowing it down. Along with WooCommerce integration and a one-click installation feature, the Speaker theme is tough to beat. All musicians want to win a Grammy, and The Grammy WordPress theme is a step in the right direction. The theme aims to maintain a classic vibe while still focusing on the professional and stylistic aspects of the site. 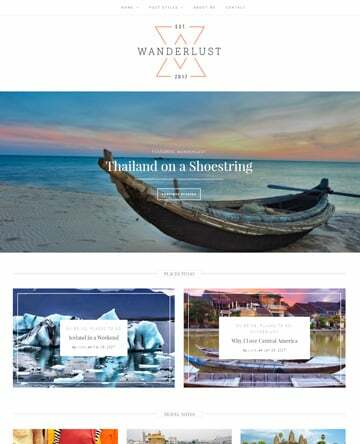 The responsive theme has wonderful tools for customizing the frontend and you don’t have to worry about having to touch any code or edit the theme’s files. Easily customize the colors and use one of the eight built-in backgrounds to stand apart from the rest of the competition. The custom typography is nice, but the notable features are band-focused. The discography management area has settings for artwork, track listing, information on where to buy it, and more. You can also auto-generate a discography list template for a clean shopping area on your site. The theme integrates rather well with a plugin that lets you manage your gigs and monetize your website. The IndieFest theme is a bold and epic theme that focuses on the visuals. The theme features a prominent logo area which you can replace with a beautiful slider. The responsive theme is designed to work on all devices, including tablets and phones. The eight built-in backgrounds ensure that your website has a unique look. Consider changing the typography and take a look into the Gig-Press plugin for handling time and location of your gigs. The theme also allows you to upload a favicon and includes featured images in all posts. The sidebar widgets are nice to include links to your social media platforms or for sharing recent post lists. Considering the IndieFest theme has over 25 different social media buttons, you don’t have to install a third-party plugin to enable this feature. The Night theme comes from the folks at Foxhound Band Themes and it is designed to let your music and posts shine. The theme allows for Vimeo and YouTube video uploads, which is always nice for sharing clips of your recent gigs. Thanks to the responsive design, your fans will be able to enjoy your music and stay up to date with your news even when they are using a mobile device. The theme even includes a full-width slider which is also completely responsive. Similar to some of the other themes above, this gem includes GigPress integration, which is a must-have for bands in the digital age. The discography management section allows you to easily add your albums, share your artwork, and show your fans where they can buy your music. Along with attractive album listings, you can’t go wrong with Night. Try out the Vocal theme if you’re a fan of dark color schemes since it features a one-page layout with black shades as the default colors. However, you can choose from various other colors in order to make it fit your brand. Vocal comes with event listings and details for keeping your fans up to date, along with areas to highlight performers, albums, and galleries. This WordPress theme integrates well with WooCommerce so you can easily sell items such as band t-shirts and even your own music. Try out the event grid layout to provide an organized way for displaying upcoming gigs. Along with MailChimp, Vocal integrates with a few other popular plugins such as the Visual Composer plugin, which is ideal for those who want to speed up the design process with a drag-and-drop editor. MailChimp integration lets you build your email list the easy way so you can stay in touch with your fans and share news about upcoming shows and album releases. 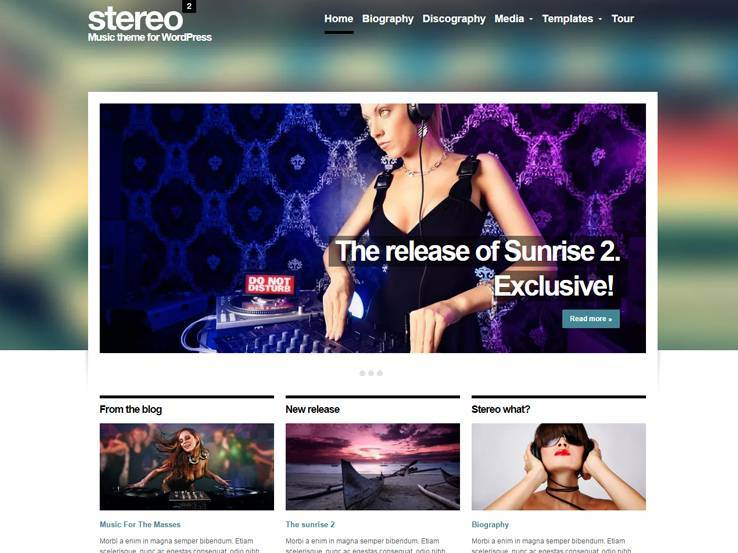 Along with a full-screen background slider, a built-in audio player, photo albums, and Vimeo support, the Vocal theme is one of the top options when it comes to music WordPress themes. 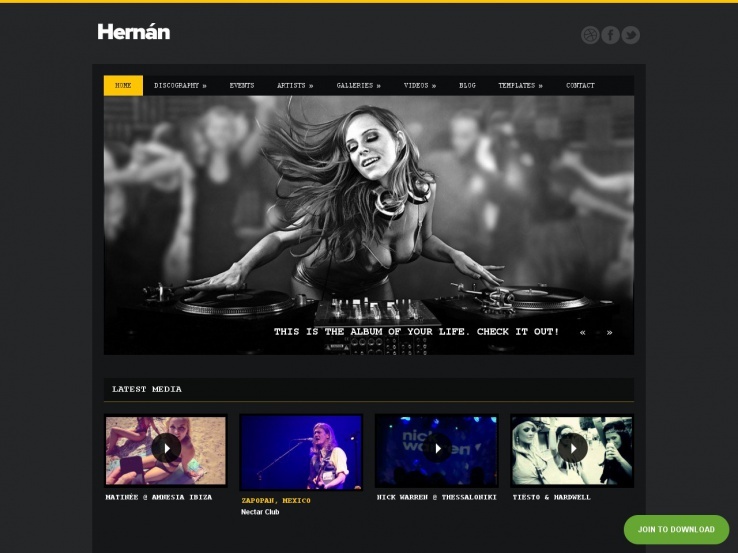 Hernan is a powerful theme for musicians because it offers a stylish design with an area to show off your discography. Not only that, but the discography management center allows you to organize and release your music without much work on the backend. An events management system makes it easy to configure dates and times for shows which is a great way to keep your fans coming back to your website. Six content types are provided with Hernan, including options for sliders, artists, and gigs. 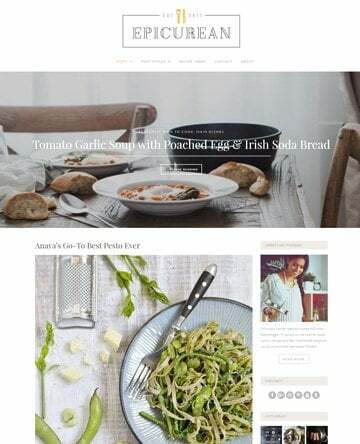 The flexible layout options make it easy to create a completely unique layout for your homepage. Custom widgets bring in even more functionality, such as modules for social media and recent posts. The Hernan theme is completely ready for search engines and it has a responsive design to boot. 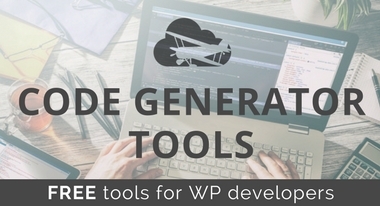 Translation tools allow you to reach out to an international crowd, while the integrated blog is great for keeping your fans up to date on the latest gigs, album releases, and more. It’s also a great way to boost your search engine rankings. 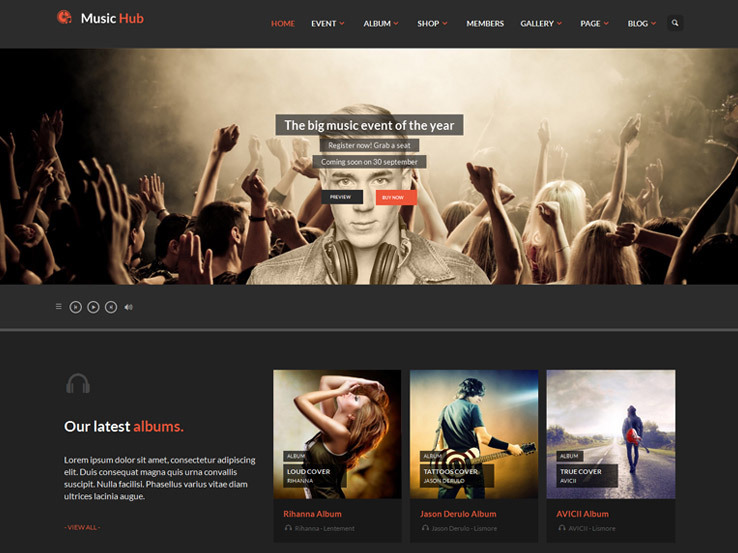 Test out the MusicHub WordPress theme if you’re looking for an option that caters to bands, musicians, clubs or parties. 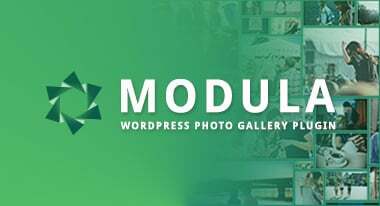 A notable feature of the theme is a module that helps you manage your events and albums. This means that you can easily share information about the upcoming weeks or months of your band’s tour. You can pair this with a giant list of your favorite albums, giving people a taste of what they can expect at your concerts. The theme is completely responsive. Quite a few premium plugins are included with the MusicHub theme purchase. One of them is the Visual Composer plugin which has a drag-and-drop interface and makes it easy to customize the layout of your pages without touching a single line of code. 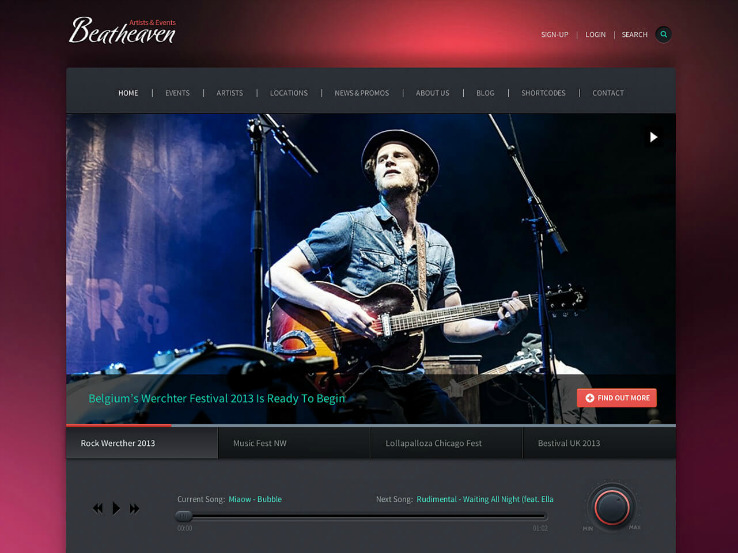 The Slider Revolution plugin provides an interesting way for you to showcase your band’s images. You can also include a call to action on individual slides to help you sell tickets. The Contact Form 7 plugin works nicely with the theme to provide an easy way for your fans to get in touch with you and the unlimited color options allow you to add your own style to your website. As a side note, the PSD files are included with the MusicHub WordPress theme, giving more advanced designers a chance to really take the theme to a new level. Sell all of your albums and songs directly through your website and organize them into a professional format. The biography section allows you to highlight all the members of your band and it includes galleries, photos, and descriptions. 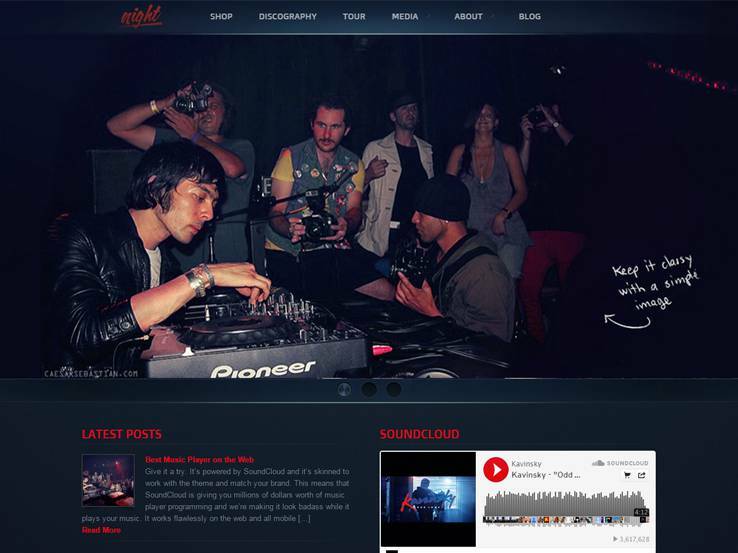 Use the blog to keep your fans up to date with your upcoming gigs and concerts. Along with social media buttons and some other really cool widgets, the MusicHub WordPress theme is a great choice for any band. The Vice theme has a stunning, modern take on the band/musician website theme, using a one-page, full-screen layout to keep all of your content in one area. This works well with the responsive layout which makes navigating your website a lot easier on mobile devices. 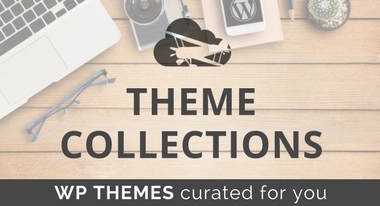 As with most one-page themes, the Vice theme has ten module types that you can re-arrange on the homepage. Use the photo and video gallery to share your coolest moments from a tour. The Revolution Slider plugin allows you to share details about an upcoming album or gigs. You can also include podcasts and share an events map so your fans can easily find directions to the venue where your next gig is held. The artist carousel features all of the people in your band, explaining what each person does. A video tutorial is provided when you buy the theme, making it super easy to get to your design process. The vertical icon menu is sure to give your website a unique look and it also comes with over 120 icons, generating a more visual layout. The one-page theme has an unlimited amount of sections and each of them provides backgrounds to show your band’s unique style. You can also create an unlimited amount of one-page websites which means it’s easy to create a landing page for your new album or any other information. The Vice WordPress theme is a thing of beauty, so make sure you keep this one on your shortlist. 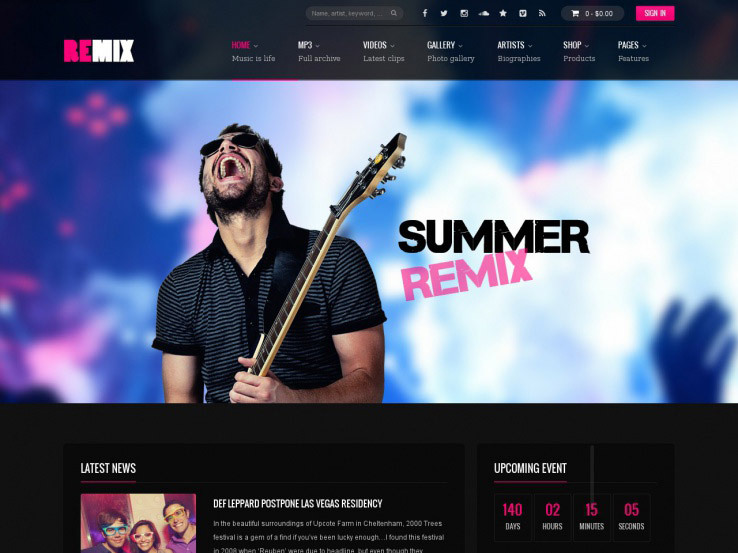 The Remix WordPress theme offers an impressive set of features and tools, starting with a collection of demos that are not only beautiful but ready to get you setup with a website as a DJ, musician or any other type of artist. The demo importer is bound to speed up the development process, while the responsive design allows mobile users to enjoy your website in the same manner as desktop users. This is a high-performance theme with AJAX functionalities. This means that your forms and pages are going to load much quicker, improving your overall user experience and SEO. The shareable player works nicely for posting your tracks and it boosts the amount of people who are going to share it with friends. 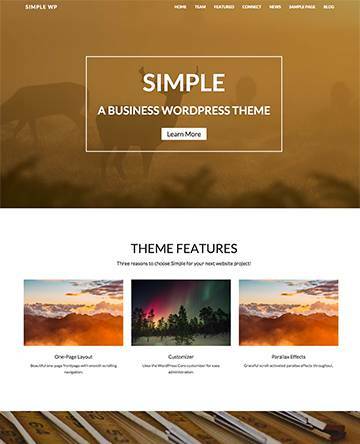 The theme also includes a visual page builder, which is essential for both advanced users and beginners. The custom player is one of the main areas of focus since it has tools for changing the look and feel of your music player. Change the fonts, colors, and icons on the player to make it fit with your band’s brand. Music charts allow you to show the most popular music on your album. It’s also not a bad idea for sharing the actual top chart to get people to come back to your website more often. Along with an online store for merchandise and various icons to make your site more visual, the Remix WordPress theme is a quality choice for all bands.